The Refund Payment step will refund a payment which was made either in the current entry or in a different entry. Note that if you're refunding a subscription then it's recommended to use the Cancel Subscription step before the refund step. 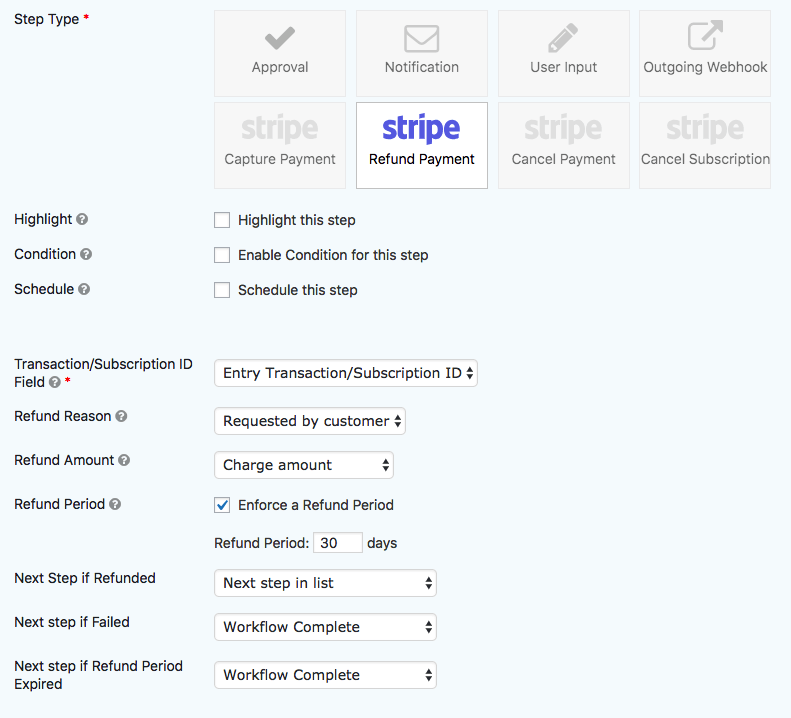 See the link at the bottom of the page for details on the Cancel Subscription step. Transaction/Subscription ID Field: Select the field containing the ID of the transaction or subscription that will be refunded. Select "Entry Transaction/Subscription ID" to refund the payment made for the current entry. If you'd like to refund a transaction in a different entry then select the field which will contain the ID of the transaction or subscription you want to refund. The dropdown will show all Hidden fields, Text fields, Subscription ID and Transaction ID fields that are on the form. See the links below for an explanation of the Transaction and Subscription ID fields. Refund Reason: Select the reason for the refund. Available options: "Requested by customer", "Duplicate" and "Fraudulent". Refund Amount: Select either the full amount charged to the customer or select a number field which contains the amount to refund. Refund Period: When the refund period is enforced then the refund will only be processed if the entry is within the refund period. For example, if you have a 30 day refund guarantee then you could set the refund period to 30 and refund will only be processed if the payment was made within the 30 day limit. If the step runs for a payment that was made before the 30 day period then the step status will be "refund period expired". Next Step if Refunded: Select the next step in the workflow if the payment was refunded successfully. For example, you could select a notification step and send emails to the customer and an administrator informing them that the payment was refunded successfully. Next Step if Failed: Select the next step in the workflow if the payment was not refunded successfully. The most likely scenario for this is that the payment was not previously captured or if the payment was already refunded. The step can also fail if the API returns an error. For example, you could select a notification step and send emails to the customer and an administrator informing them that the payment was not refunded successfully. Next Step if Refund Period Expired: Select the next step in the workflow if the refund period expired.